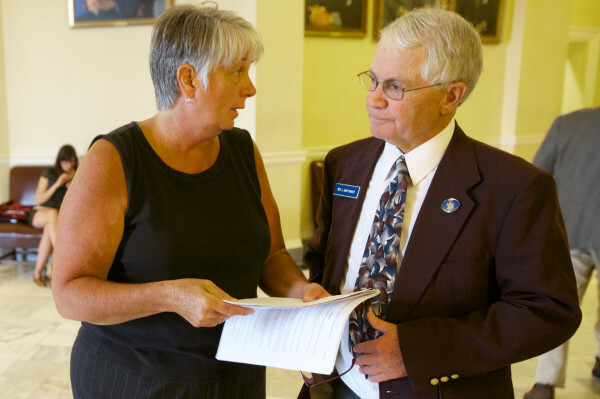 Terry Hayes discusses a bill with Rep. Gary Knight, R-Livermore Falls in 2013. AUGUSTA — If you get any kind of check from state government, you are going to see Terry Hayes’ signature on it — at least for the next two years. Hayes, an independent who was recently elected state treasurer, said that’s one of the weirdest things about her new job. A former Democratic state representative from Buckfield, Hayes left the party in 2014. She was elected by a joint convention of the Legislature last month in a shake-up, of sorts, that gave Republicans a chance to break a Democratic grip on the state’s constitutional offices of secretary of state, treasurer and attorney general. Eighty-eight Republicans and at least six Democrats cast ballots for Hayes to give her the win over incumbent Neria Douglass of Auburn, a Democrat. But Hayes, who said her core ideals are still more aligned with rural Democrats than with Republicans, has no intention of playing favorites as the state’s top financial officer. Her eight years of service in the Legislature have taught her to find pathways toward compromise with members of both parties, she said. She became an independent out of frustration with a two-party system that often seems more intent on doing what’s best for the political party and not what’s best for the people of Maine, she said. She said she left the Democratic Party largely because party leadership was too cozy with its allies outside government. Hayes, who earned a bachelor’s degree from Bowdoin College in 1980, completed a master’s degree in business administration last year at Thomas College in Waterville. Hayes said she ran for treasurer instead of getting out of politics altogether because she knew she could do more. “I think I still have a value proposition that will benefit Maine, and this was an opportunity to pursue it,” she said. One key change Hayes said she would like to usher through during her first two-year term is to give Mainers more information on what they are buying with the money they’ve borrowed in the form of voter-approved bonds. Each year, voters approve millions of dollars in borrowing, and while each ballot question gives a general statement about what the money will be used for, Hayes wants voters and taxpayers to be able to see precisely what that borrowed money buys. She is proposing to find a way to make sure the agencies that benefit from state-financed borrowing also have a means to show how the money has been used. She has said repeatedly that she believes the funds are being used properly, but that it should be easy to track what they are being used for. Hayes said that in 2010, voters approved a transportation borrowing package that totaled $47.5 million, but few people would be able to tell you specifically what that money was spent on. She doesn’t doubt it was spent to fix Maine’s roads and bridges and was more than likely coupled with federal money to boost its buying power. But, unlike other parts of state government, there is no easy way to look it up and find out. Changing that is one of her top goals as treasurer, she said. Hayes also said she wants to be a resource to state lawmakers and Gov. Paul LePage. She has high hopes of having strong working relationships with both LePage and members of the Legislature and that, while she doesn’t always agree with LePage and lawmakers, she does know how to disagree with civility. “I’ve been trying to think of a time when [LePage] and I have been at loggerheads over something, and I haven’t come up with anything,” Hayes said. Noting that she doesn’t fully agree with all of LePage’s politics, she also recognizes some of his goals as being highly laudable and important. Hayes said she has no designs on using the post of treasurer as a launchpad to a higher office, nor does she intend to use it to unnecessarily affect state politics. Unlike one of her predecessors, Bruce Poliquin, now Maine’s 2nd District U.S. congressman, she said she doesn’t want to go to Washington, D.C., to be a lawmaker.